On April 29, 1983, the palm trees were swaying on a warm Florida spring day. At its Melbourne headquarters, Harris Corporation’s senior management let out a huge sigh. After prolonged negotiations they had finally offloaded the massive Web business to a consortium of senior management, led by longtime Web division employee James Pruitt and several bankers. This leveraged buy-out (LBO) needed to raise the US$225-million sale price included Clayton & Dubilier, Kidder Peabody & Co., Solomon Brothers Inc. and notorious junk bond firm Drexel Burnham Lambert Inc. Yes, that firm that employed the stock pumping trader — Michael Milken. 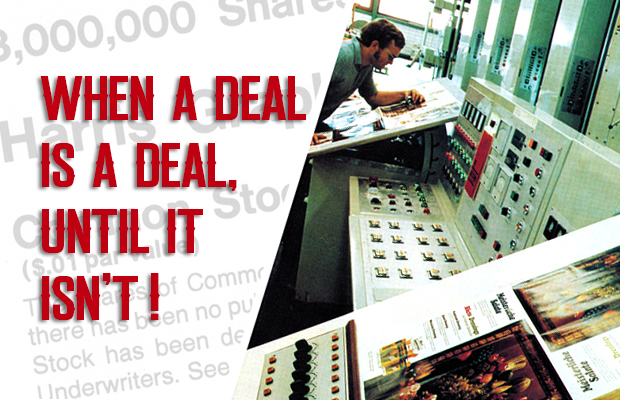 This was to be the printing industry’s largest deal ever. Can we help you pack? At the time of the transaction, it was reported the Web division represented about 24 percent of the sales and profits of Harris Corp., but the sale only represented “book value.” An odd announcement when it seemed everyone on Wall Street agreed this division had boasted a growth rate of 16 percent during the last several years. But in 1983 Harris Corp. just couldn’t close the sale fast enough – offering up employees, special deals on land and buildings – anything including, one suspects, helping Pruitt and the boys pack up their offices. Don’t let the door hit you on your way out! Certainly there was nothing wrong with the product. Harris Web was legendary and engineered iconic presses such as the M200 and M300. The M1000 was the most popular heatset web press ever made. Harris seemed to have a sense that the growth of print was about to decline and moreover, electronics would be a much better horse to have in the race. Looking back now it’s remarkable to see Harris’s foresight. In 1982, Harris Corp. sales were $1.72 billion (all figures in U.S. dollars). Today it is a $6-billion business with no connection to its roots as a printing press builder in Ohio. Onward and upward or so this new entity, renamed Harris Graphics, thought. These folks owned the world’s largest and most successful web manufacturer in the world and at a discount. Now laden with debt and fees from the bankers (Clayton – $3 million, Drexel – $1.75 million), the firm struggled. After all, we were coming out of a severe recession and building web presses was an expensive business. A very short three years later, Harris Graphics would be sold again. Bridled with meagre cash flow, the company sought to go public and engineered an IPO during the summer of 1984. However a scathing article in the June 25th Barron’s newsletter downplayed the exuberance of Wall Street. Harris Graphics was pummelled for being cheeky and greedy boys and Barron’s questioned why anyone would want to pay such a high premium for stock from a company that just a year prior had bought the business on the cheap. The IPO had friends, namely Ivan Boesky, the infamous stock trader. All the noise drew interest from an odd bed-fellow in Chicago. AM International, the new name for the old duplicator business of Addressograph-Multigraph, jumped in and bought Harris Graphics in June 1986 for $246-million, including $100-million of assumed debt. In December 1986, AM was subpoenaed by the Securities & Exchange Commission (SEC) for information about AM’s acquisition. This was due to the SEC’s probe into Drexel-Burnham-Lambert’s association with arbitrageur Boesky. Even though AM negotiations were secret, Boesky, it was learned, had already accumulated Harris Graphics stock and held as much as 8.4 percent by late October 1985. What a coincidence. Boesky, Drexel and financier Saul Steinberg had reaped fat profits on the Harris Graphics IPO, helping to pump the stock prior to a sale. Boesky was loosely characterized as Gordon Gekko in the movie Wall Street. It was also Boesky, who in 1986, would implicate Michael Milken before he himself was imprisoned and forking over a $100-million fine. Not to be outdone, the attorney for the southern district of New York, Rudy Giuliani, honed in on Milken for which Milken too went to jail. No accusations were ever brought against these men or AM International. The ramp-up to AM’s purchase actually began in May 1985 when the billionaire Bass family of Texas made a play for Harris at $17 per share. Bass would go on to sell New York’s Plaza Hotel to Donald Trump in 1988. AM swooped in and paid $22 per share ($246 million) in 1986. AM quickly figured out web press margins weren’t what it hoped. Adding to the misery they had a bunch of other serious technical problems, especially in the Fort Worth plant, that were dragging down the business. There would seem to be a fissure between competence and ineptitude at AM from the start. Prior to summer 1987, Komori Printing Machinery Co., Ltd. (now Komori Corporation) began to sniff around the AM/Harris business. Komori attempted overtures to AM’s CEO Merle Banta and at the same time quietly started accumulating AM stock. In fact Komori owned 3.9 million shares or 7.6 percent of AM by the time it turned up the heat. Initially Banta re-buffed Komori. Then came an offer — $181 million cash plus Komori’s AM stock and assumption of $52 million in debt totalling $250 million. Banta and AM gleefully accepted and the house was sold! Or was it? Both parties would go on to sign a non-binding letter of intent. That last bit would prove to be the chink in the armour of a deal. The suave move buying up stock was the only reason AM would sit down with Komori in the first place. Earlier attempts by Komori had been loudly rejected. By Independence Day 1988, Komori was giddy with excitement over the scoop. Just think, a mere 68 years prior it was Harris who introduced the offset press to Japan. Now Komori, long in the shadows, would own the iconic press maker. Overnight Komori would leap-frog to a place at the top of the printing game. Takeo Shimamura (GM of Komori’s planning office) explained Komori simply had no excess capacity to produce enough web presses. These comments came just after Komori had recently sold a whopping $55-million press order to France’s Imprimerie Jean Didier. Harris’s Montataire, France, factory was just what Komori needed for its beachhead into Europe. Shimamura also said no one at Komori had even toured any of the Harris factories yet, but rumours indicated Chairman Ichiro Komori had indeed walked through the New Hampshire plant. By July 1988, that non-binding contract would raise its ugly head. AM shocked the industry when it announced it had another buyer and for more money! Clearly Banta and AM relished having someone top Komori’s offer. M. Sato, Komori’s senior managing director, was really fuming when he said, “We may conclude to refuse to participate in a process in which only one of two bidders has complete information.” So who was this mystery late bidder? But here was AM, just barely dodging Chapter 11 bankruptcy in 1984, making money again — in spite of lousy management, buying Harris Graphics in 1986, and now essentially getting its money back by selling the Web division to a pint-size Komori who had sales of $430-million in 1987. AM reported revenues of $688 million in 1987 and its Harris Graphics division posted sales of $326 million. Across the Atlantic Ocean, Heidelberger Druckmaschinen (Heidelberg) – at the very top of the food chain – was also having a banner year. Sales and margins were up and Heidelberg already had a fledgling web program. Were the Japanese thinking they could scoop this prize? Not without a fight! Recent events had also troubled Heidelberg ever since Komori had come out with its Lithrone sheetfed in 1981. Komori went from being harmless to rivalrous. 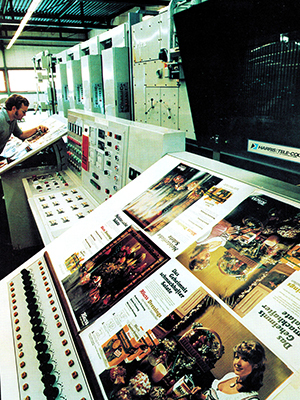 Heidelberg, at that time, was four times the size of Komori, posting sales of $1.2 billion in 1988. By July 28, 1988, Heidelberg stormed in and threw another $50 million at the feet of AM. All done in secret. Not even Komori knew its offer had been shared with others. AM immediately said yes and handed over the car keys to Heidelberg. Komori attempted a “Hail Mary” and fired off an odd offer of $203 million just for the Harris European operations. Characterized as laughable, analysts could not fathom such a bizarre offer — somewhat likened to trying to buy the two front seats of a car along with the radiator. Between clashing designs and I.P. it was somewhat ridiculous and quickly ignored. Heidelberg’s deal pushed Komori aside with only a stalking horse or topping-up fee of $5.25 million. Along with the cash, Komori received a promise it could unload the now-unwanted 7.6 percent stock in AM. By 1992 Komori held 6.4 percent and one surmises that on AM’s 1993 foray into another Chapter 11 perhaps Komori was stiffed again, holding worthless shares. Heidelberg, after spending $300 million, went on to pour millions more into the Harris Web group, eventually purchasing the Sheridan bindery division from AM in 1996. The M3000 Sunday press came under Heidelberg’s watch. Now up against the mighty Goss, Heidelberg spent another fortune retooling its newspaper portfolio, launching the Mainstream just about the time newspapers started feeling the effects of the Internet. For a short time it felt like all-out war between Heidelberg’s Horst Schlayer and Bob Brown of Goss. Finally in 2004, bleeding from both the Web and Kodak Digital segments, Heidelberg sold off Harris to Goss and held a 20 percent stake in Goss for its efforts. So one might ask, who was the real winner in the Harris Graphics business? Clearly Komori was. Had Komori been successful, it surely would have suffered the same fate as Heidelberg. Perhaps the size of Harris could have ruined a much smaller business — too many plants and people, and too much overhead. Although Harris was a leader in web-based machinery and excelled at pretty much every segment, the Web business itself was about to nose dive. In 1988, no one saw it coming. Back then it was all about running speeds, automation and more colour. In an era when there was seemingly endless demand, it was the right time to buy a web press builder. Today the Web business is but a trickle of its former self. Even manroland web systems joined forces with Goss in 2018. Komori went on to develop successful web presses such as the System 38S and wisely stayed out of the newspaper/Coldset segment other than a 1989 purchase of the French company Chambon (specialty narrow web and gravure) and Toshiba’s Web business. Komori used its own talents to grow the business. And grow it did, now recognized around the world not only for sheetfed but also web. Komori lost that bloody Harris battle – which was particularly unfair – but ended up winning the war. Komori went on to develop successful web presses such as the System 38S and wisely stayed out of the newspaper/Coldset segment other than a 1989 purchase of the French company Chambon (specialty narrow web and gravure) and Toshiba’s Web business. Komori used its own talents to grow the business. And grow it did, now recognized around the world not only for sheetfed but also web. Heidelberg took a major financial hit when it offloaded Harris and again with its joint venture with Kodak. But they too were smart to exit before it was too late. Today both Heidelberg and Komori are wiser, smarter companies looking at the next wave of print technology: Digital. Komori lost that bloody Harris battle – which was particularly unfair – but ended up winning the war. Sometimes you win by losing first.